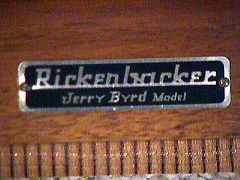 Rickenbacker JB 10 "Jerry Byrd"
Rickenbacker® Model JB 10 "Jerry Byrd"
Model JB 10 "Jerry Byrd"
Hawaiian Steel Guitar - Rickenbacker Jerry Byrd, short-scale, 22 1/2" console. Pictured here a 1965 JB 10 string model. Two-toned walnut natural finish body, three legs. 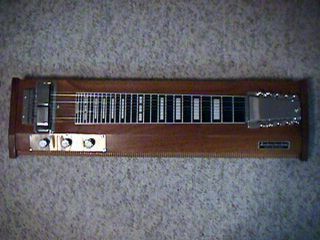 Rickenbacker introduced the Jerry Byrd series of console steel guitars in the late 50's. The factory made these to Byrd´s specifications and he promoted them with personal appearences for the company at the trade shows and the feativals.